Bitten! is a conference-wide augmented reality game designed for the 18th session of the United Nations Federation for Climate Change held in Doha, Qatar in December 2012. The theme of COP18 was Malaria, and from the previous years, it was noticed that delegates, representatives and general participants rarely interacted outside of their parent organizations. This seemed counter intuitive to the intent of the conference, which was committed to providing a platform for different strategies in Climate Change advocacy and policy making to communicate with each other. Taking the Malaria theme, we developed a game where every person in attendance at the COP, from foreign ministers, climate scientists, activists, students and entrepreneurs were all playing the game by default. Since the COP is a formal event, we couldn't have a lot of wild actions like consensual touching (not even a handshake without permission, since some foreign delegates had high security risks), also, given security and geographical limitations, we could not canvass the location beforehand to optimize it;s structural assets, so for the final game we had to think fast and work around several constrains. However, we love a good challenge, we decided to use the constrains to our advantage. To begin with, a conference of over 3000 participants is a handful to manage. In order to create a robust in-game ecosystem, we incorporated Twitter to communicate the state of the game-world to willing participants. Since physical contact was precarious, we decided to use the only natural interaction between all the participants – passing business cards around. All our playing cards were business-card shaped to allow for innocuous opportunities to play without disrupting the ambience of the conference too much! Next, we since the common theme amongst all the participants was that they were humans from all over the world, we started the game with a whole lot of humans who were a part of the game if they chose to play or not. 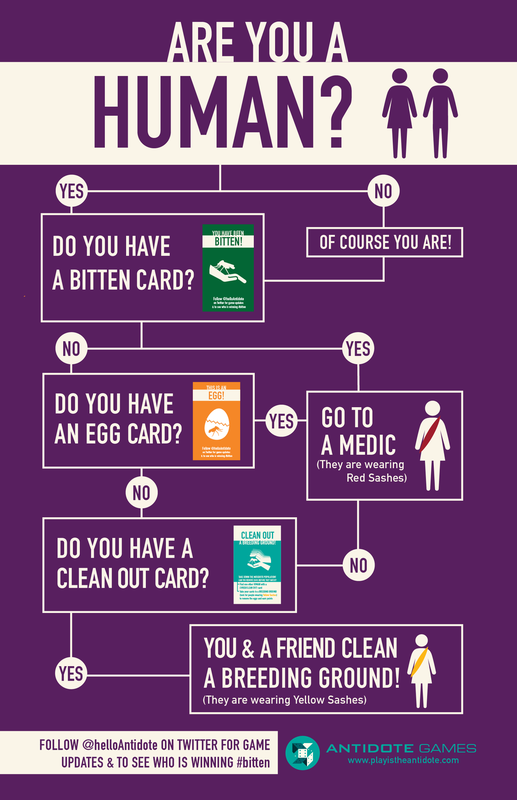 "Humans" by default would have a choice either to continue to play the game as the more passive "Human" players, or take on the more aggressive and combative role of the "Mosquitoes". Mosquitoes started out by being fewer in number, but mimicking vectors in nature, they had an ability to "breed" fast. Mosquitoes had the ability to "convert" humans into mosquitoes to play along with them if they collected a brown "Mosquito" card. 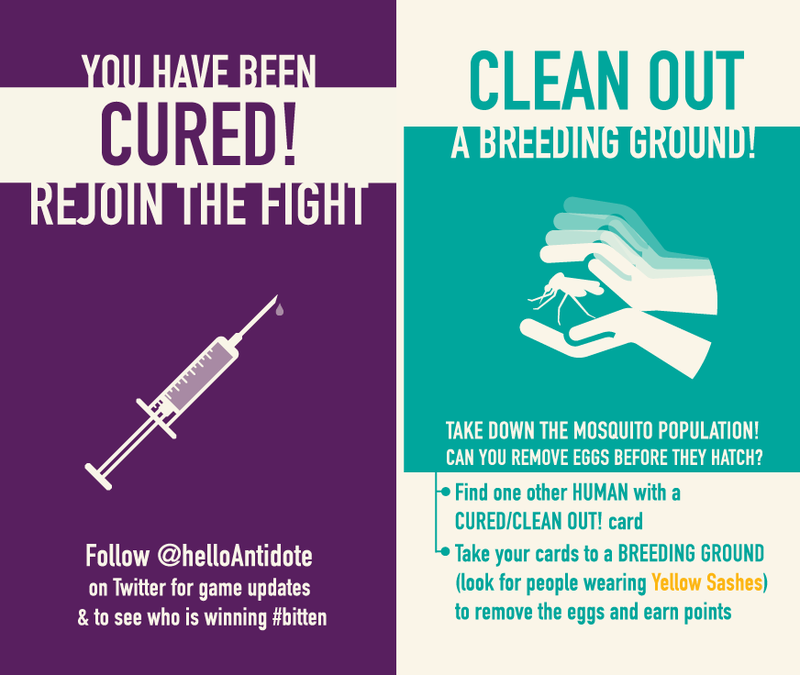 These cards were given to "Mosquitoes" if they collected enough "Bitten" cards to go with an "Egg" card – mimicking the mosquito lifecycle of feeding and breeding. This buddy system gave participants a chance to play along with their friends or make new ones on the fly! Contact us if you would like to design a game for your conference!